Mega Moolah is an amazing slot game which brings to the players a high level of excitement in full-swing. The jungle theme, the wild characters, the happy background – everything about the game makes the players go gaga over this slot game. Read on to know everything about this slot in detail. 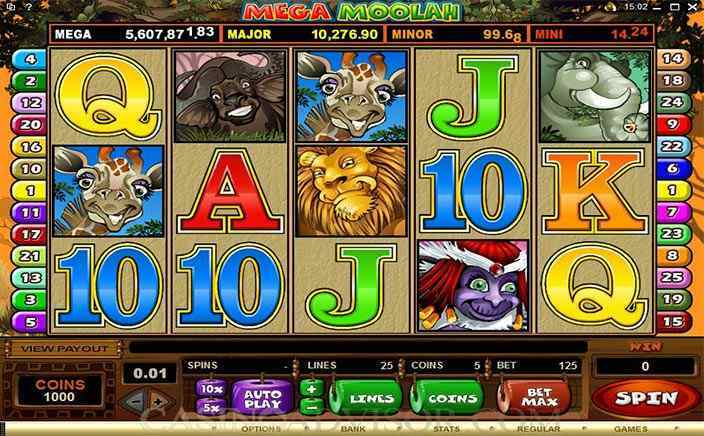 Mega Moolah slots have been designed and developed by the renowned Microgaming. This company is ruling the gaming world today. It has given the players a number of interesting slot games carrying huge jackpots as well as amazing features. Every slot developed by Microgaming has something special about it. The slots is a traditional progressive slot game that comprises of five reels and twenty-five paylines in three different rows. This slot can be played by both the novices as well as the veterans with the same level of excitement and enthusiasm. The symbols involved are very vibrant and include the lions, monkeys, water buffaloes, zebras, antelopes, elephants, and giraffes. Along with these symbols, there are low-value playing cards that are represented by Jack, King, Queen, Ace, nine and ten. These are clearly visible on the screen. The minimum bet that you can play during this slot is 1p and it can reach to a maximum bet of 5p respectively. This slot also allows you to wager a maximum of 125 coins per spin. There is a wild in the slot that is represented by the lion and if two wilds appear on any active payline, the gameplay gives you winnings in order. These two wild symbols fetch you with 15 coins. Three of them provide 125 coins and four of them give you 1500 coins. And if everything goes well with your luck and you end up landing five of them, you will be rewarded with whopping 1500 coins. Also, this symbol serves as a multiplier. Hence, if it forms a portion of a winning combination, all your credits will be doubled. Mega Moolah slots also involve free spin bonus. You can get it if minimum three scatter symbols are seen anywhere on the screen. The scatter is represented by the monkey and it certainly increases the chances of winning cash prizes for you. 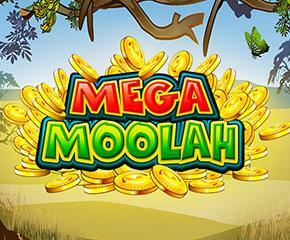 Mega Moolah slots is a brilliant game involving some really friendly rules and biggest cash prizes. From its very theme to the symbols used, the developers have designed it with a true sense of fun and excitement. Play it now and win some of the biggest cash prizes.